There, in the front seat of the car: it's Barbara Walters! I have proof. A moment before, I was heading to the stage door in hopes of getting Barbara from my window when I discovered that she was already on her way out. I found myself in the unusual position of the street level paparazzi. I grabbed a few shots in the hope that I could find some way to use them. I had a similar situation with Samuel L. Jackson a few months ago. Unlucky timing meant I only got his leg as he climbed into his SUV. One more CelebriLeg photo. 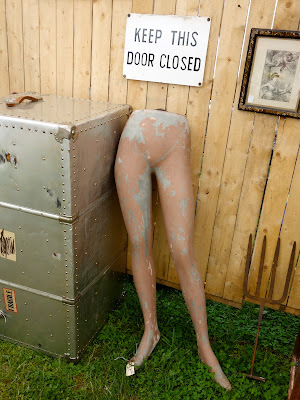 Spotted at the Brimfield flea market, these are extremely accurate replicas of the legs of Brian Williams. I do have proof, but I had to promise Brian I would never publish the photos. Let's just say busy newsmen sometimes forget to put on pants before dashing over to the Late Show. You promised Brian you would never publish the photos? Having seen what Mr. Williams has done to others unlucky enough to meet him on the street, I would say you're toast. Technically I've kept my promise. I've only published a photo of a REPLICA of the lower half of Brian Williams' body. Just keep the door closed and everything will be fine.